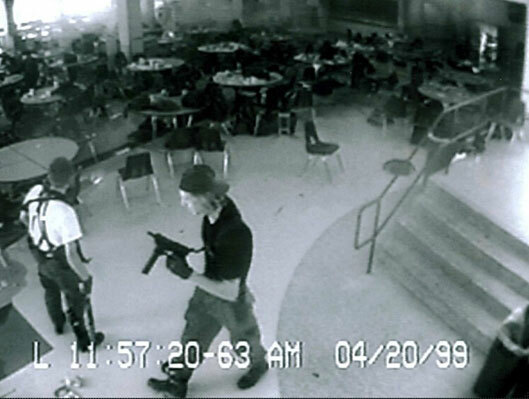 The two shooters caught on Columbine’s high school’s security cameras in the cafeteria. In 2009, the International Center on Media & the Public Agenda (ICMPA) conducted the largest study to that date of how accredited journalism programs across the U.S. taught their students to cover violence, how to deal with the trauma of survivors, and how to manage their own personal and professional responses to such situations.. ICMPA found that 3/4 of the 106 schools did not yet offer stand-alone courses dedicated to teaching students how to cover violence and trauma. The study did find that the vast majority of surveyed educators agreed that their students should be taught how to cover violence and trauma — not just of school shootings, but of the kind of stories that most journalists will cover repeatedly throughout their careers: urban crime and traffic accidents, domestic violence and natural disasters, missing children and returning veterans, international wars and home-grown terrorism. Why didn’t faculty members at top U.S. journalism schools teach students how to cover violence and trauma? Many reported they felt unqualified. The study found that only faculty with prior working-journalism experience felt sufficiently confident to tackle teaching such topics. In fact faculty who had formerly been journalists themselves were more likely to include modules on how to cover violence or how to interview victims in their classes than their faculty peers who had never worked outside of academe. There were additional problems mentioned by the survey respondents. Many educators believed that they also lacked sufficient time in their classes to add modules on covering violence. Some also noted that even if they were to try to teach such topics, there were insufficient resources to give students. The educators expressed a desire for a central clearinghouse of information, syllabi, projects, and assignments related to covering violence and trauma. the moral, ethical, and professional responsibilities of journalists in covering traumatic events. Many core issues related to covering violence and trauma, such as being a first responder or dealing with trauma and stress reactions remained essentially unexamined in US classrooms. At the close of the survey, ICMPA conducted over 20 interviews with working journalists to get a sense of how those currently in the profession see the importance of training in covering violence. Those journalists who were interviewed confirmed that for them and their peers covering traumatic events can negatively affect their professional and personal lives. Some revealed that memories of covering trauma have lingered and are not easily suppressed. Most of those journalists who were interviewed agreed that trauma training should be made an essential part of career preparation, but many were skeptical about the effectiveness of journalism curricula on the issues. Researchers at ICMPA used an online survey of 57 questions to examine the experience and attitudes of 623 faculty members at over 100 US universities and colleges with journalism or mass communications programs, departments or schools accredited by ACEJMC (Accrediting Council on Education in Journalism and Mass Communications). To supplement that survey, ICMPA researchers also analyzed related syllabi and curricular material submitted by some of the surveyed faculty and interviewed working journalists. The leader authors of the journal article resulting from the study were Jad P. Melki, American University of Beirut, Megan E. Fromm, Johns Hopkins University and Paul Mihailidis, Emerson College. This study was funded by the Dart Center. The study’s findings and conclusions do not necessarily represent the views of the Dart Center. The FULL WEBSITE, INCLUDING A PDF OF A JOURNAL ARTICLE FROM THE STUDY, IS AVAILABLE HERE.